Across from the M&H gas station at Point of Rocks Park, there is a gap in the rocks, a ravine, for which in the past appeared to have many buildings around it. Was this the location of Duluth’s Little Italy? It seems like it may have been. The big question, however, is what is with the ravine there? It seems to be man made, and almost as if they were attempting to continue Superior Street, as it lines up near perfectly. The buildings slowly disappear over the decades, until they all seem to be gone by 1989. Was this ravine an attempt to continue Superior Street, or was there some other reason for it? It’s been fascinating me for some time. 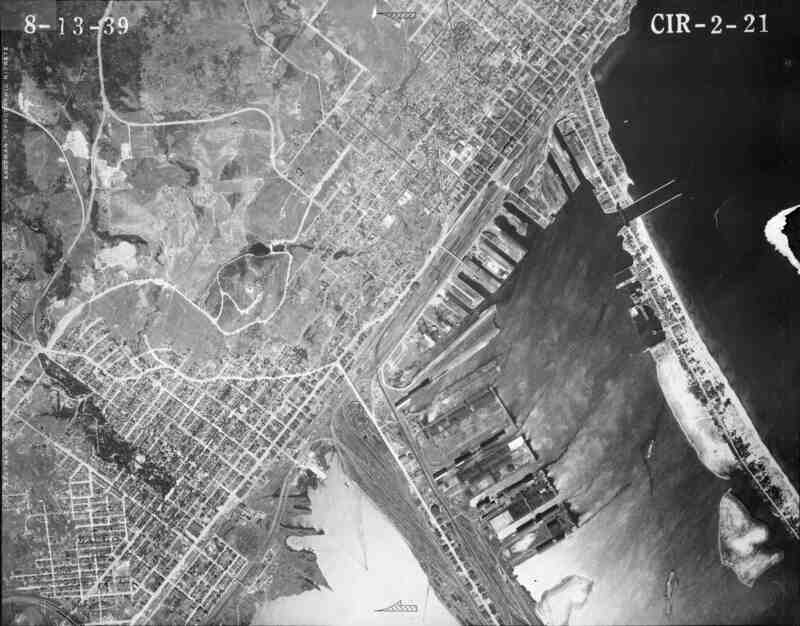 (I’ve included links to historical aerial photos of the area). Four years ago I posted a heap of information about Point of Rocks on PDD. In the very early 1900s there were scattered shacks along Michigan Street at Point of Rocks, and by 1918 there was a lot of blasting going on in order to push Superior Street through there. The rock was too much for man and machine, however, and eventually they gave up. I'm not sure if the area you are referring to was technically part of Little Italy. I think Little Italy was up the hill a bit from there. I remember seeing your post but not about the cut in the rocks. If the cut in the rocks goes back that far, some of those homes/buildings were on some precarious footings. It does seem like they were biting off more than they could chew. The point of rocks is very fascinating, there's a lot of history there, and a lot of places have disappeared but there's some foundations left behind in some places still. I've wondered about this myself, having noticed the foundations and rock anchors when hiking through the area along that section of the SHT. I've noticed quite a few homeless camps there the last few years in the Point of Rocks and Central Park area - does this use go back a while, or is it a newer development? Here's a history of Little Italy, aka, "The Glenn."